Neil Young started taking an interest in popular music around the age of ten, with a wide variety of influences, including Little Richard, The Fleetwoods and Johnny Cash, but idolised the King, Elvis Presley. Much to Ang’s approval, Neil started his musical journey on a cheap, plastic ukulele, and steadily upgraded to a good ukulele, but oddly, not a guitar. Young dropped out of school and formed bands left right and centre. He moved to Ontario and recorded a bit with his band The Squires. It was during this period he met Stephen Stills, a relationship that some might call fairly important to his future (No spoilers here). Young left The Squires and moved to Winnipeg where he met Joni Mitchell. He wrote Sugar Mountain while there, and had his first big hit, albeit by fellow Canadian band The Guess Who charting with Young’s song, Flying On The Ground Is Wrong. 1966 came and Young joined the Mynah Birds, delving in to the Motown scene, but he was soon picked up by the Navy for being AWOL. After the Mynah Birds broke up, Young and bassist Bruce Palmer moved to LA. Once there, they met up with Stephen Stills and formed Buffalo Springfield. They enjoyed a lot of success with this band, until management dramas forced a disbandment. Young took this opportunity to go solo, and signed a record deal with Reprise Records, joining Joni Mitchell and her manager. They immediately started work on, and released his first self titled solo album, which Young himself did not enjoy. For his next effort, he drafted in a young band by the name of The Rockets, renamed them Crazy Horse, and released the reason we’re all here: “Everybody Knows This Is Nowhere”. This is such a great album. I really enjoyed listening to the whole thing, even the ten minute tracks, ‘Down By The River’ and ‘Cowgirl In The Sand’. I think it was an excellent plan to start the album with arguably the two best tracks. I’m confident in saying that ‘Cinnamon Gir’l is far and away the best track on this album. The driving distorted sound of Young’s famous “Old Black” Les Paul really moves the song along and is accompanied by a steady rolling bass riff. In fact, the bass is excellent through the whole album, and really cuts through. Also, the vocal harmonies are a standout, as Danny Whitten of Crazy Horse sings a high harmony from beginning to end. Turns out old mate Neil wrote ‘Cinnamon Girl’ while crook with a high fever, because that’s the normal thing to do. ‘Cowgirl In The Sand’ and ‘Down By The River’ were also by products of this delirium. You think ‘Down By The River’ is long at nine minutes? Young once played it with Booker T, Duck Dunn and Frank Sampedro in Germany for TWENTY SEVEN MINUTES. Yep. That be hard to stomach. ‘River’ is probably my least favourite track on the album, but that’s not to say it’s bad. It’s a classic bluesy murder ballad, quite sparsely interwoven with lyrics. Everything about it musically is spot on, I just felt like it went for about five minutes too long. The title track to the album is a ripper too, though here’s one I feel could have gone longer! It’s only two and a half minutes long, and thirty seconds of that was lalalalalas! The rolling lyrics are impossible to not tap your feet to. Musically, it’s a simple song, but sometimes simple is best. The melancholy ‘Round And Round’ is the epitome of folk music. It features nothing but an acoustic guitar and Young’s vocals, with someone called Robin Lane that no one’s ever heard of providing backing vocals. It’s a shame she only sang on one track, she really added a new dimension to it. They wanted to go out with a bang, and ‘Cowgirl In The Sand’ is that bang. Ten minutes of musical genius. The surging guitar, driving drums and rising bass make it a joy to listen to. Which is perfectly applicable, because this whole album was a joy. More Neil please! Listening to Neil Young always takes me to another place. Sometimes it takes me to imaginary childhood summers that I never even had or to an old willow tree down by the river bank. Sometimes I feel like I could be laying in a field of cotton, the warm breeze rustling through the long reeds as I gaze upwards at a cloudless blue sky. That’s the best kind of music, the kind that transports you to somewhere new. 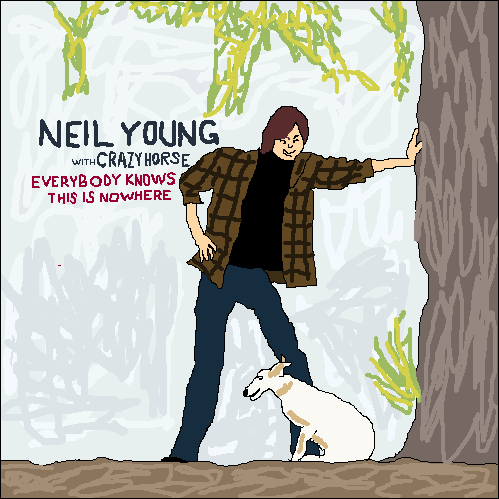 “Everybody Knows This Is Nowhere”, Young’s first studio album with his backing band Crazy Horse is no exception to the rule. Much to this listener’s delight, Young presents a wonderful 40 minute assortment of sorrowful and tender tracks, in his sun-drenched musical style that has become so synonymous with the late 60’s. I have always loved his signature high-pitched vocal style. On this album he takes on a particularly melancholic and emotive style of singing and his retrospective tone imparts regret and sadness. For me, the standout tracks are standards ‘Cinnamon Girl’ (killer riffs) and ‘Down by the River’ (great harmonies). I also really dug the mournful lament ‘Running Dry’ which featured some lovely and haunting violin solos. My only criticism of the album is that the improvisations were a little too drawn out. In some cases they ended up tarnishing the songs rather than embellishing them because they just lead nowhere. I was not au fait with this album until now but I completely fell in love with “Everybody Knows This Is Nowhere”. I’m now looking for an original copy of the vinyl record so I can add it to my growing collection. My dad is a massive Neil Young fan and my childhood was heavily peppered with his music. When I left home and realised that I didn’t have any of his albums, I asked my dad to make me a Neil Young mixtape (remember them?). From there I slowly started to delve into all his albums. Dad had included three songs from this album on that cassette: ‘Cinnamon Girl’, ‘Down by the River’ and ‘Cowgirl in the Sand’ – arguably the best tracks here. ‘Cinnamon Girl’ is a timeless rock gem that doesn’t sound dated at all. It was supposedly written about Pamela Courson, Jim Morrison’s girlfiend, the title referring to the colour of her hair. Neil plays the song in D modal tuning, where the E notes on the first and sixth string of the guitar are lowered to D. Unusual at the time, it became widely utilised by bands in the 1990s; possibly another reason Neil earned the title of the Godfather of Grunge. His soloing on this record had many dubbing him ‘One Note Neil’, but if the opening notes on his ‘Down by the River’ solo aren’t perfect then I don’t know what is. 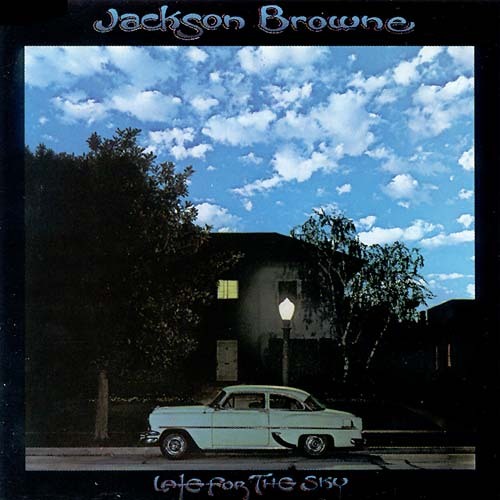 The album stalls during the slower songs ‘Round and Round’ and ‘Running Dry’, with the latter’s violin contribution from Bobby Notkoff grating the ear of this listener, at least. The title track, used wonderfully in Almost Famous, is another highlight of mine, and the shuffle of ‘The Losing End’ makes for a fun singalong. I think this album would have been stronger if one of the slower tracks had been dropped in favour of ‘Winterlong’, a live favourite which wouldn’t surface until Neil’s “Decade” compilation in 1977. Sadly, Crazy Horse’s original guitarist and vocalist Danny Whitten died of a drug overdose in 1972 making this the only Neil Young & Crazy Horse album he appeared on. Over his long career Neil Young has straddled many different genres and with good reason has been dubbed ‘the godfather of grunge’. There’s something special happening on “Everybody Know This is Nowhere”. Released in November, 1969 it was released at a time where the sound of music was changing. The borders between the genres were getting evermore blurred, allowing creative artists like Young to push the boundaries. It’s the rough edges on “Everybody Knows This Is Nowhere” that make it album so great. Is Young the greatest guitarist in the world? No. Are his vocals pitch perfect? Not at all. But that’s what makes this album so exciting. It allows the listener to connect to the music in a very personal way. For me it’s the looseness and long drawn out guitar jams that take this album to another level of greatness. From the jangly lead in tracks like ‘Cinnamon Girl’ to the lamentful fiddle on ‘Running Dry’… it’s all just so so good. It’s clear that it was recorded over a short period of time and really allows Young and the band to capture that moment. I’m hard pressed to pick a favourite song because the whole album is so solid. Know that ‘Cinnamon Girl’ did just make my Essential 20 songs list though. It’s evident to me that a lot of the bands I love wear their Neil Young influences proudly on their sleeves. Maybe I loved it so much because of that. Or maybe I’m excited that Spring is upon us and this is the perfect sunny afternoon soundtrack. Or maybe Neil Young is just awesome at what he does. 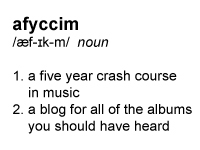 Regardless, this may very well be my favourite afyccim album thus far.